I found out that proper etiquette for veterans is to thank them for their service. I have developed the habit of asking if there are any veterans in a group that I am addressing and then gratefully announce: “Thank you for your service.” The journey to get to this place has spanned my career in recruiting. What a change from my initial experience in working with transitioning veterans. During the Vietnam era, society did not seem to have room for the returning warriors that we sent to protect us. It seemed that the very act of going to war to preserve what America was somehow changed the perception of those patriots – they returned not as heroes, but as second-class citizens. The transition from military to civilian life should be comparable to leaving hell for heaven. However given the ambivalence of arrival back in the “real world”, I suspect many veterans felt like they were still in hell. In addition to not being welcomed home as heroes, transitioning veterans had a challenging time finding civilian jobs when they returned. A few companies have always seen the value of hiring veterans, but certain sectors of the economy offered little interest in this source of talent. It is great to see that we finally seem to be appreciating the value of the veteran. About 18 months ago, I was eavesdropping on a conversation between Eric Winegardner and Gerry Crispin. These two staffing thought leaders were discussing how to best serve our military coming home from our current campaigns. Their commitment was admirable. Their initiatives were inspirational. Their passion was contagious. Frankly, I suspect, I was a little envious of their opportunity to serve this great cause. My opportunity to serve was coming; I just did not know it. A few months later, I was recruited by Sean Kelley, a staffing leader at Microsoft (and former Navy officer) to join a hand-picked virtual staffing team that would impact the manner in which Microsoft would engage the military channel. That team, combined with an employee-initiated group of current and former veterans at Microsoft, forged a unique alliance; we call it We Still Serve. The We Still Serve portal showcases the great work of our team. Two of our really cool features are a Military Job Decoder and Live Chat. The Military Job Decoder allows a veteran to map their military experience to jobs at Microsoft. 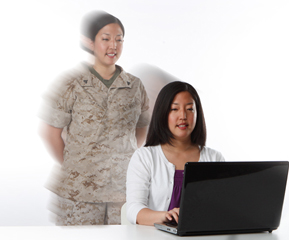 The Live Chat feature allows a veteran to connect with a person at Microsoft that shared a military experience. The Microsoft volunteers (current or former veterans) are employees that are passionate about assisting a fellow veteran make the transition of military to civilian life. We built out our community presence on several social media platforms—LinkedIn, Facebook and Twitter. Our team envisions We Still Serve to be “a sustainable and scalable veteran recruiting model and military outreach program that benefits Microsoft by enabling the business to attract high potential, diverse talent with solid transferrable skills.” But it is really more than a recruiting initiative – I believe We Still Serve is a prototype what talent communities can become—the merger of affinity groups and staffing. The teaming of committed colleagues around an initiative that share a common vision and mission, allowing each member to use their respective gifts and abilities, is the essence of community. My experience with We Still Serve has been eye opening. Not only have I experienced true community, I have also seen honor and respect awarded to a group that is most deserving. It has taken three or four decades to reach a point where we can separate war from the warrior; the “cause” from the combatant; and politics from the people who risk their lives to serve our great nation. My hope is as we celebrate Veterans Day, we remember to say – thank you for your service.